Criminals can place card skimmers over or even inside authentic card readers. These skimmers allow criminals to steal credit or debit card data by reading the information contained on the card when it is swiped or inserted. Often combined with a concealed camera, thieves can also record your Personal Identification Number (PIN). With this information, thieves can withdraw money from the victim’s bank account and make unauthorized purchases. Additionally, the thieves may sell this information to others. According the National Association of Convenience Stores, 37 million Americans fuel their vehicles and 29 million pay for their fuel by debit or credit card every day. Most often, only one skimmer is installed at a site that may have from 8 to 24 fuel payment points. When a skimmer is installed, it captures an average of 30-100 cards per day. 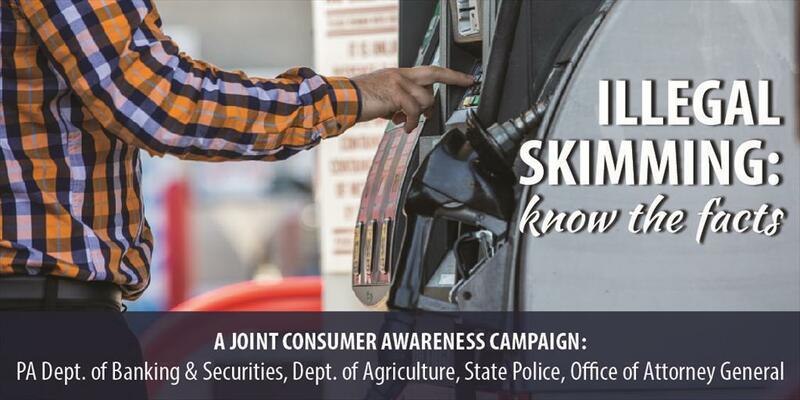 There is no reliable data on the number of skimming incidents but they are a small fraction of overall fill-ups. Use ATMs in well-lit, secure locations and avoid using ATMs that are stand-alone units in corners of stores or other out-of-the-way locations. Look at the card reader slot and surrounding areas to see if anything looks out of place, mismatched, or loose. Make sure no one is watching you enter your PIN (or possibly filming you on a cell phone). Consider using your credit card instead of your debit card to avoid compromising your PIN and to gain other consumer protections. Choose gas pumps that are closer to and within the line of vision of the cashiers. Check your bank and credit card statements frequently to watch for fraudulent activity and report any unfamiliar activity immediately. Consider re-keying the locks on doors that have access to electronic payment data. Consider investing in anti-breach kits for dispensers offered by manufactures, which generally notify and shut down dispensers that are accessed without proper security code entry. Take the dispenser offline to discontinue transactions. Have a technician identify the device, but do not remove or touch it. Call your local police. Remember, this is a crime scene and the perpetrators are probably doing the same thing to other retailers in the general area. After the investigation, ask for a dated police report.